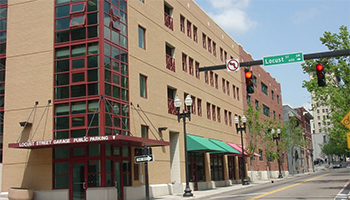 Parking is available in the Locust Street Parking Garage located at 540 Locust Street, Knoxville, TN. You can also catch the Knoxville Trolley from many downtown locations. CLICK HERE to view more information about the Knoxville Trolley. CLICK HERE for a map and printable directions. Take I-40 East into downtown Knoxville area. Go through tunnel to Henley Street. Stay to your left on Henley Street to turn left at the second traffic light. Take the second left, which is Walnut Street. Go through the stop sign at Clinch. Locust Street Parking Garage is the first entrance on the left. Take I-40 East exit. Merge immediately to far right, taking the Henley Street exit ramp. Locust Street Parking Garage is on the left just before the Locust Street and Clinch Street Intersection. Take Hwy 129 North to I-40 East. From I-40 East, take Exit #388 (U.S. 441, Smoky Mountain Exit). The exit will be to the right. Go through tunnel to Henley Street. Stay to your left as you exit the Tunnel on Henley Street to turn left at the second traffic light. Take the second left, which is Walnut Street. Go through the stop sign at Clinch.